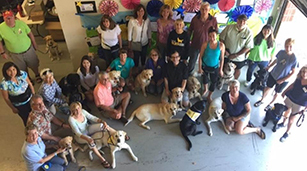 The California Dreamin' Chapter consists of enthusiastic volunteers, puppy raisers and graduate teams from Orange and Los Angeles Counties. We have a lot of fun. Our mission is to support Canine Companions for Independence through fundraising and community awareness. If you’re looking for deeper engagement as a Canine Companions volunteer, we encourage you to get involved with our chapter. The California Dreamin' Chapter (Los Angeles & Orange Counties) is an extension of the Southwest Regional Training Center. We work to raise awareness, recruit new puppy raisers and volunteers and support one another’s work on behalf of the Canine Companions’ mission.